Cauliflower, as its name implies, is a flower growing from a plant. It is a member of the cabbage family and closely related to broccoli, kale, and turnips. It can come in a variety of colors ranging from white to purple and orange. 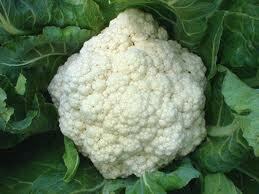 Cauliflower is fat and cholesterol free, very low in sodium, and a good source of Vitamin C and folate. You’ll want to include cauliflower as one of the cruciferous vegetables you eat on a regular basis if you want to receive the fantastic health benefits provided by the cruciferous vegetable family. At a minimum, include cruciferous vegetables as part of your diet 2-3 times per week, and make the serving size at least 1-1/2 cups. Even better from a health standpoint, enjoy cauliflower and other vegetables from the cruciferous vegetable group 4-5 times per week, and increase your serving size to 2 cups. As with all vegetables be sure not to overcook cauliflower. We suggest Healthy Sautéeing cauliflower rather than the more traditional methods of boiling or steaming, which makes them waterlogged, mushy and lose much of its flavor. Cut cauliflower florets into quarters and let sit for 5 minutes before cooking. For great tasting cauliflower add 1 tsp of turmeric when adding the cauliflower to the skillet. Cauliflower, a cruciferous vegetable, is in the same plant family as broccoli, kale, cabbage and collards. It has a compact head (called a “curd”), with an average size of six inches in diameter, composed of undeveloped flower buds. The flowers are attached to a central stalk. When broken apart into separate buds, cauliflower looks like a little tree, something that many kids are fascinated by. Surrounding the curd are ribbed, coarse green leaves that protect it from sunlight, impeding the development of chlorophyll. While this process contributes to the white coloring of most of the varieties, cauliflower can also be found in light green and purple colors. Between these leaves and the florets are smaller, tender leaves that are edible. Raw cauliflower is firm yet a bit spongy in texture. It has a slightly sulfurous and faintly bitter flavor. Cauliflower will keep for up to five days if stored in the crisper section of the refrigerator. If the head is not purchased wrapped, store it in an open or perforated plastic bag. Keep the head stem-side up to prevent moisture from collecting on it. For the best flavor, cauliflower should be eaten as soon as possible. Precut florets do not keep well, and they are best when eaten within a day of purchase. To freeze: Remove any leaves from the head of cauliflower by peeling them off with your hands. Cut the head of cauliflower into 1-inch florets using a sharp knife. Rinse off the cauliflower florets with warm running water to remove any lingering dirt. Fill a large pot with water and place the pot on the stove top. Add 4 tsp. of salt to the water for every gallon of water you use. Bring the water to a boil over high heat on the stove top. Add the cauliflower florets to the boiling water and put the lid on the pot. Boil the cauliflower for 3 minutes. Use a slotted spoon and gently remove the cauliflower florets from the boiling water. Alternatively, you could pour the florets into a colander. Put the hot cauliflower florets in a bowl of ice water immediately to cool them off and stop the cooking process. Thoroughly drain the cauliflower florets using a colander. Place the cauliflower florets in a single layer in zippered freezer bags. Lay the bags flat in the freezer to freeze the cauliflower. If you purchase pre-cut cauliflower florets, consume them within one or two days as they will lose their freshness after that. Since cooking causes cauliflower to spoil quicker, consume it within two to three days of placing in the refrigerator after cooking. When cooking cauliflower, you may leave the head whole. Rapid cooking time not only reduces the odorous sulfur compounds but also preserves crispness, color, and reduces the loss of nutrients that will leach into the cooking water when vegetables are overcooked. Steaming and microwaving cauliflower will better preserve its vitamin content, especially the B vitamins, than if it is boiled. To microwave: Put 2 cups of florets in a shallow microwavable dish, or cover a whole head of cauliflower with plastic wrap. For florets, cook for 3 minutes on high, then let stand for 2 minutes. For whole cauliflower, cook on high for 3 minutes, turn head over, and cook for an additional 2 to 4 minutes. Let stand for 3 minutes. To Steam: Place it in a steamer basket, and then place in a pot with 2 inches of water. Cover and steam. Florets will take 3 to 5 minutes to cook. A whole head of cauliflower (1 ½ pounds) will take 15 to 20 minutes to cook, but begin checking for tenderness after 12 minutes. To Bake: Place florets in a shallow baking dish and brush lightly with olive oil. Bake at 350 degrees for approximately 20-30 minutes (or until desired tenderness). Sprinkle with grated parmesan cheese if you like. Cauliflower can also be eaten raw. The raw florets can be a nutritious snack. Try them with a low-fat dip, or include them in your favorite salad. Cauliflower contains phytonutrients that release odorous sulfur compounds when heated. These odors become stronger with increased cooking time. If you want to minimize odor, retain the vegetable's crisp texture, and reduce nutrient loss, cook the cauliflower for only a short time. Some phytonutrients may react with iron in cookware and cause the cauliflower to take on a brownish hue. To prevent this, add a bit of lemon juice to the water in which you blanch the cauliflower.